Looking for a way to spend some QT with the kiddos and stretch those creative muscles together? Check out our list of super, local studios where you can paint, sculpt, craft and more! Forget the meal planning, shopping, prepping, cooking AND cleaning! 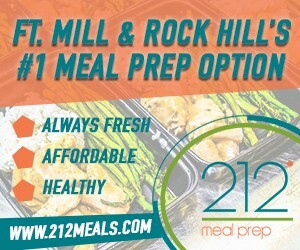 212 Meal Prep provides a tasty menu each week. You simply select what tickles your taste buds, then pick up in Fort Mill or Rock Hill. You will love the time and money saved, and the leaner waistline!